It’s been ages since I updated this place! 18 months to be precisely. But a good amount of travelling and Age of Empires’ing has been done in the past one and a half year, so it’s worth scribbling about it. I’ll probably catch up in a random fashion, writing about whichever trip comes in mind first. Let’s go back to February 2013, the first trip of 2013. Me and a friend decided to visit Istanbul, the ancient capital of -oh so many empires-. 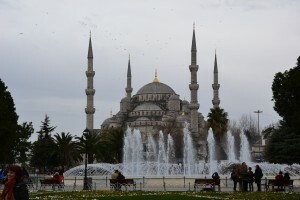 Where to start, Istanbul is a huge city, with 14 million inhabitants it’s one of the world’s most populous cities and even more populous than my whole country. Not only is the city filled with a lot of people, but also with a lot of interesting bits and bobs of history. 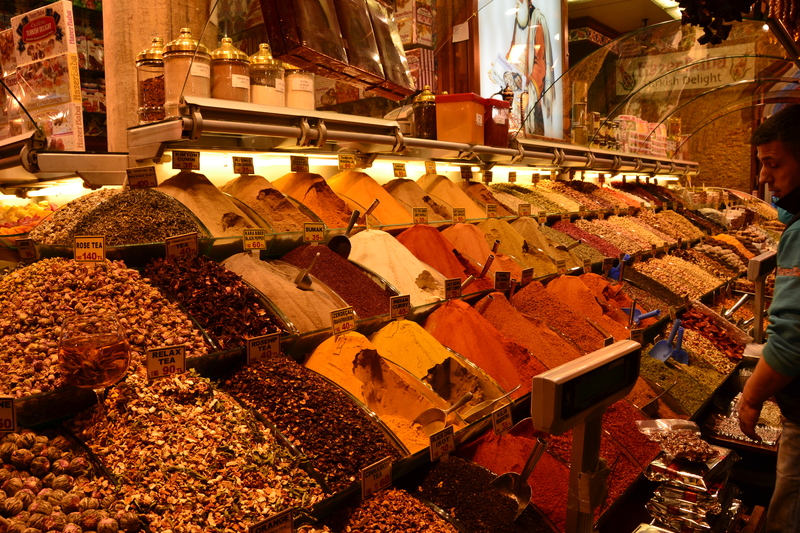 Istanbul has been a crossroad of cultures for centuries. 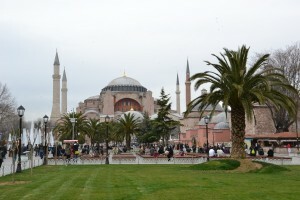 In 330 the city, then known as Byzantium became the capital of the Eastern Roman empire. It was quickly renamed to Constantinople but remained the capital of the Byzantine empire for over 1000 years. The biggest landmark they left in the city is the Hagia Sophia, a church, later turned mosque sitting right in the city center. Crossroad of cultures is not an exaggeration in this case, just turning around at that exact same spot will make you stare in awe at the Blue Mosque. For those wondering about its namesake: the blue part comes from the blue tiles adorning the interior of the Mosque. 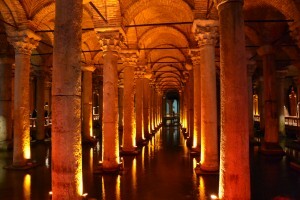 Istanbul is one of those rare cities with actual underground attractions. 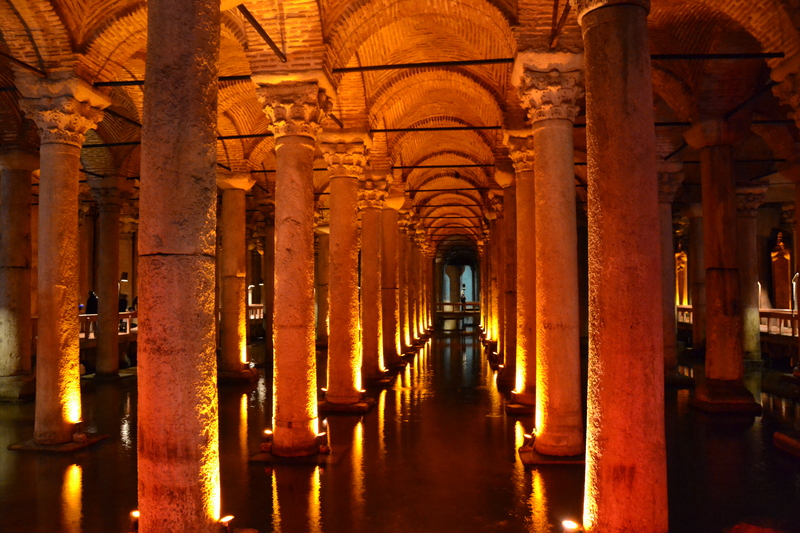 One could call it a flooded basement or you could call it the Basilica Cistern, an ancient water reservoir that could hold up to 100 million liters of water. That’s plenty of cups of Turkish tea. Talking about tea! Turks love their tea, every day around noon you see young men running around from shop to shop with a tray of tea, giving all the vendors a tasty shot before they carry on their daily routine of getting flocks of tourists to buy their goods. 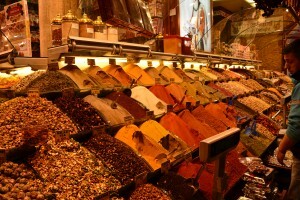 I have to hand it to them though: they’re good at it and a Turkish market, or bazaar has a unique atmosphere. Don’t let this picture fool you though: it was insanely crowded at that place and I’m still not entirely sure how there weren’t any more people in the frame. Or at least, a bunch of arms waving around. Matter of fact, the city is very crowded, but with 14 million people, what can you expect. Time to flee away from the crowded parts then, so me and my friend hopped on the boat to the more quiet, Asian side of the City. Istanbul is quite literally the bridge between the two continents and I’ve never been to Asia before. Even though the Asian side is mostly a residential area, I considered it a chance not to be missed! We only stayed there for a few hours and the only notable landmark seemed to be the Maiden’s Tower, which served as the decor for the overly dramatic final scene in the James Bond picture “The World is not Enough”. Then again, if you like some James Bond, you’ll see a lot more scenery from the films downtown as already 3 Bond films had substantial parts in Istanbul. To be fair, this post, neither the mere 4 days we stayed in Istanbul don’t do the city justice. I think you could easily spend a full week in the city going full-on touristy. Additional things not to be missed: a hammam (you’ll never feel so clean), getting some food from the street, Turkish deserts, lots of museums going from Ancient to Ottoman Imperial history and boatloads of tea!